The pop-up camper can be collapsed for easy storage and towed by most vehicles. This trailer has a dry weight of 3721 pounds and has a dinette slideout, toilet and more! 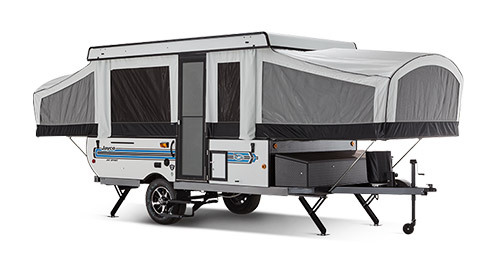 When the time comes that your family’s needs outgrow camping in a tent, but you are not quite ready to make a sizable investment, Pop-Up Trailers (also known as Tent Campers) are a fantastic option. With prices starting around $5,000 and the fact that you don’t need a big vehicle to haul them, these RVs are a great way to share the camping experience with your family. And believe us when we tell you that modern versions of the Pop-Up Trailer or Tent Camper are remarkably better designed and equipped than those of previous generations. If you grew up with a Pop-Up Trailer, you would be more than pleasantly surprised by the improvements that have been made to them. Low down payment requirements and affordable monthly payments make buying a Pop-Up very easy. So don’t put off that family vacation one second more! There is a big beautiful world of natural wonders and unique roadside attractions waiting around every corner for you and your family and friends to explore, so get going! Small and compact means fast setup at your campsite and Pop-Up Trailers don’t take up much space when you are back at home. With their lightweight, Pop-Ups can be easily towed by even smaller family cars. 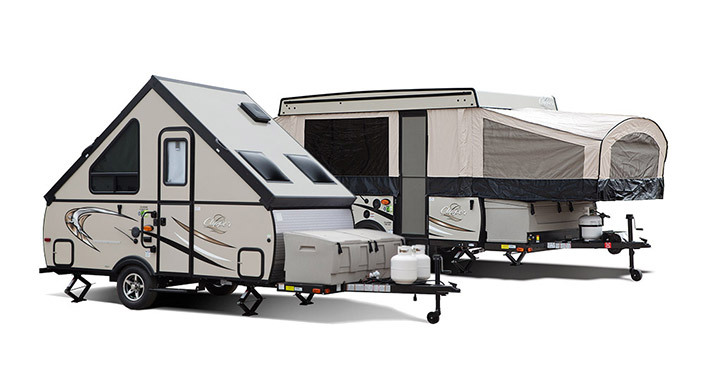 Their low up front purchase price means that they are a great way to break into the world of RVs. Perfect for those just starting out in the camping lifestyle. Able to be positioned into tight campsites by hand. A surprising amount of living space with kitchen, dining, and sleeping amenities. Versions with slide-outs in the middle of the model offer even more space. Optional Bathroom facilities in some models.